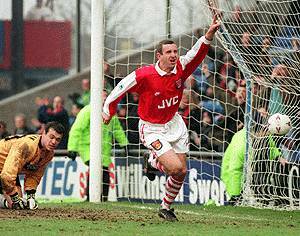 give you a pictorial insight into HIGHBURY - The home of the Arsenal Football Club. 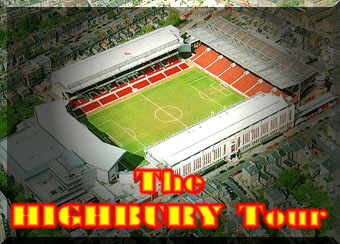 On September 5th 1913, Woolwich Arsenal moved to Highbury in North London. Exactly how Highbury came into reckoning when a move was decided upon is not known. In the end though, Woolwich Arsenal paid a massive �,000 for a mere 21-year lease and agreed not to stage any matches on Good Friday and Christmas Day (due to the property being leased from St Johns College of Divinity) these restrictions were lifted in 1925 when the club paid another �,000 to buy the whole site outright). The following year, the serious work started on the ground. 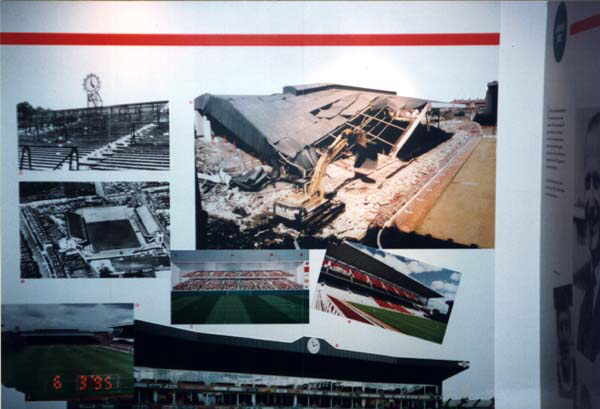 The pitch was levelled (the north end had to be raised eleven feet, the south lowered five), a new grandstand was partially built and turnstiles and terracing installed. The West Stand cost �,000 and was officially opened by the Prince of Wales (later the Duke of Windsor) on the 10th December 1932. It was actually first used on the 12th November for a game against Chelsea (Arsenal won 1-0) and was, by a large margin, the grandest and most expensive structure on any league ground at the time. It incorporated three flats, an electronic lift, and had 4,100 seats and the lower lever, which was originally all standing, could in theory hold another 20,000. While the West Stand was being built in 1932, a story that has become a bit of folklore at Highbury occurred. Local inhabitants were encouraged to bring along their rubbish to help in the process of raising up the banking on all four sides of the ground. 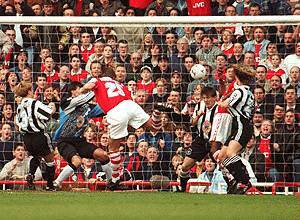 One coal merchant backed up too close to the hole in the North Bank and saw his horse and cart disappear into the cavity. The animal was so badly injured that it had to be destroyed and it is buried where it fell, in the middle of the North Bank terracing. One reason for this was because it had an expensive public frontage - the West Stand is built almost entirely behind a row of houses and is effectively invisible from that side. n 1936 Arsenal Football Club opened their new East Stand for the game against Grimsby on 24th October 1936 (scintillating 0-0 draw). 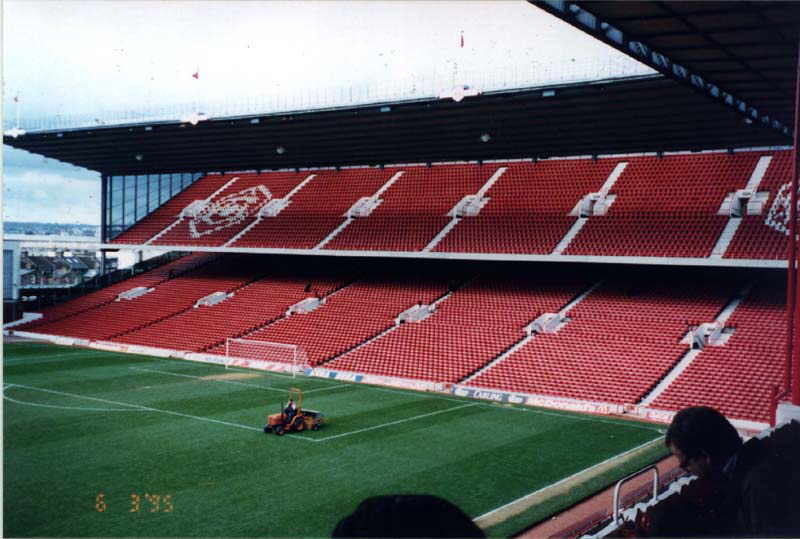 The main stand, though planned to be identical to the West Stand, finally cost far more (�0,000). 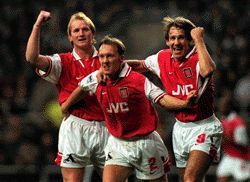 The pictures will give you an insight into what has been part of the majesty that is ARSENAL FOOTBALL CLUB. 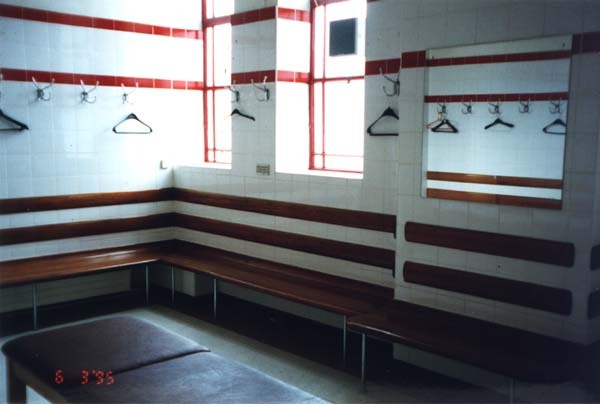 They include pictures of the ground as it is today, and some of the facilities, honours and memento's that has placed the club at the forefront of both traditional values and supporter comfort. 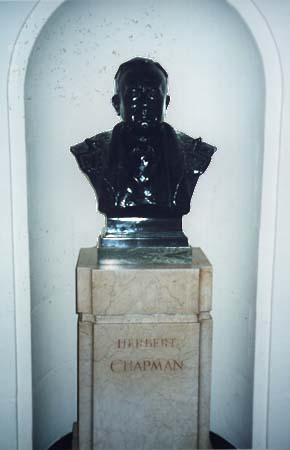 As you enter the East Stand and the world famous "Marble Halls", the first thing you are confronted by is the black marble statue of Herbert Chapman the Arsenal Manager from 1925 to his death (due to pneumonia) in January 1934. 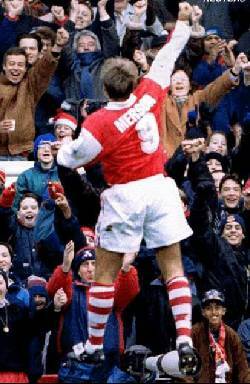 When Herbert came to Arsenal, they had little hope or chance of challenging for any trophies. By 1934, they had won three Division One Championships, been runners up twice, won the FA Cup, and also been runners up twice. Herbert created the Arsenal that were recognised worldwide as the epitome of Football. 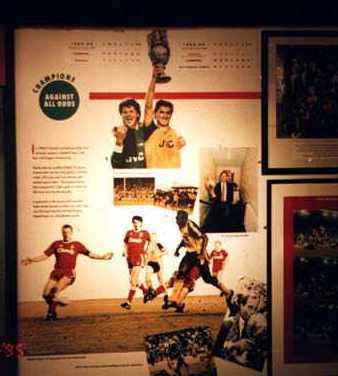 As you mount the stairs inside the Arsenal main entrance, on your right is the picture of "The England Seven". 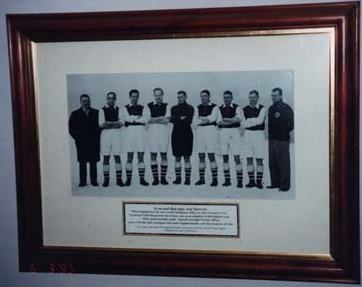 On the 14th November 1934, no less than seven Gunners were chosen to play at Highbury against Italy (the current world Champions) Seven men from the same club in the same England team is a modern record (that only Liverpool have equalled) and it fully reflected the fact that Arsenal were such a dominant force in the 1930's. The line up (left to right) George Allison (Club Manager), Wilf Copping, Ray Bowden, George Male, Frank Moss, Ted Drake, Eddie Hapgood, Cliff Bastin and Tom Whittaker (trainer for Club and Country). England won a brutal game 3-2. Drake scored one of the goals. 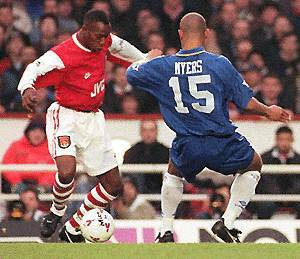 As you reach the first landing, on your left is the Arsenal Football Supporters Club "Player Of The Year Shield". 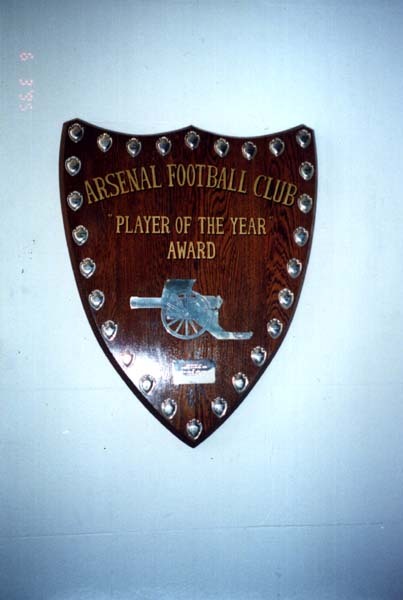 This shield is awarded each year to the player voted by the members of the supporters club as their favourite Arsenal player. 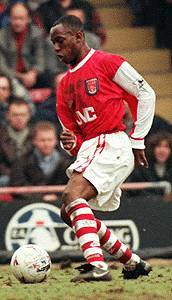 It is adorned with the names of the Arsenal greats, and is still used to this day with the current player having a small silver engraved crest added to the trophy with his name on it. 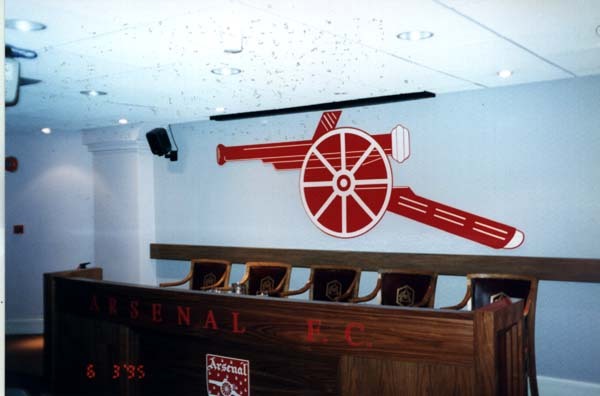 Here are three pictures of the Arsenal Team Dressing Room in the East Stand. 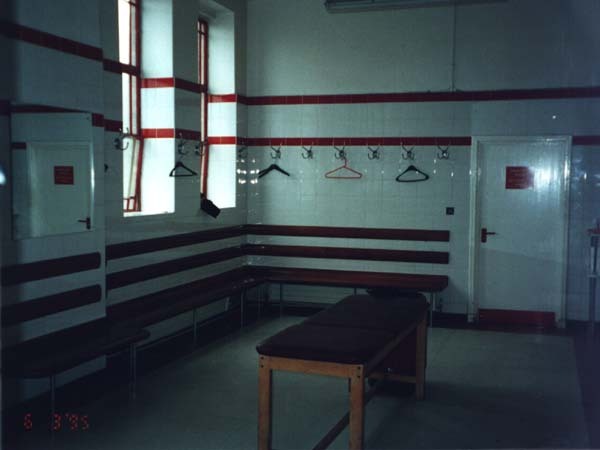 When it was originally built, the dressing room was literally "State-Of-The-Art" it has under-floor heating so that the players don't have to walk around on freezing cold tiles, and has the physios room on the right hand side (the closed door in the picture below). I suppose they didn't want us visitors attacking the medicine cabinet.... 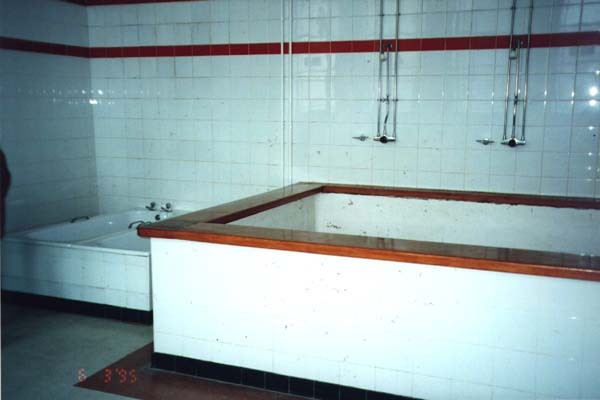 The third picture is of the team bath. It used to be used after every game until recently when, due to health reasons, it was emptied for the last time. The players now use a number of individual baths that are in the bathroom, and can relax in the knowledge that they will not catch each others infections or life-threatening diseases ;-). 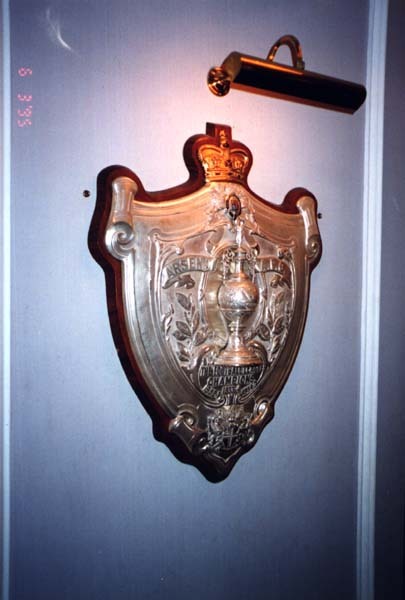 This Triple Championship Shield hangs outside the boardroom on the first floor of the East Stand. It commemorates the hat trick of Championships that Arsenal won between 1932 and 1935. Huddersfield and Liverpool have almost identical trophies. (Sorry about the from-the-side shot, but head-on the trophy shone too much). 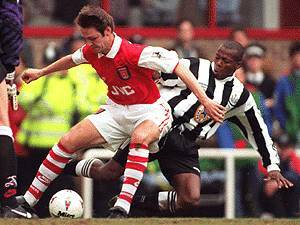 Whilst Arsenal have not always shared the best of relationships with the British Press, they can have no complaints about the service that Arsenal Football Club provides them with. 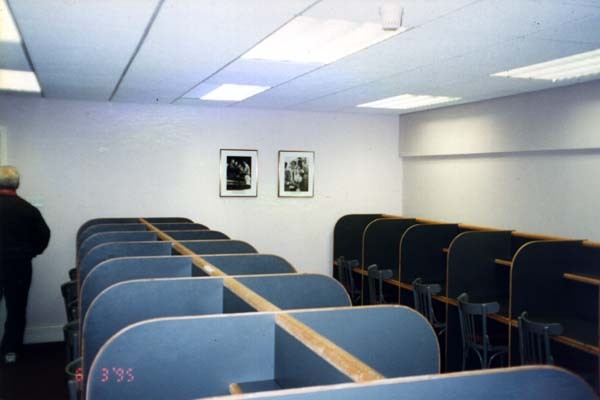 These Press Boxes are where the journalists congregate at half time and after a game to write their match reports etc..
Each box has a separate telephone line that can be used for calls, faxes, or nowadays network connection directly to their relevant publications. Once again, when Arsenal do something, they do it in style. Their Press Conference Room is a small theatre. It can show films, sound and video to the invited members of the British Media. This is where new players are introduced and any important announcements are made. (Once again I must make an apology for this picture, as there must have been some dirt on the scanner. The ceiling was perfectly clean on the day I saw the room, and the photo makes it look dirty. Sorry Arsenal). The recently erected North Stand. The stand was re-built after the Taylor Report recommended that ALL Football League stadia become all seater after the Hillsborough Tragedy on the 15th April 1989. As I told you previously, the North Stand houses the Arsenal Museum. 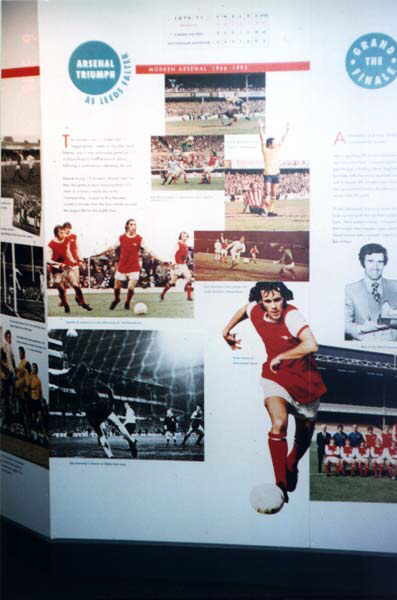 It is a multi-media festival of Arsenal memorabilia. It has sections dealing with "THE GLORIOUS HISTORY" from 1886 to today. 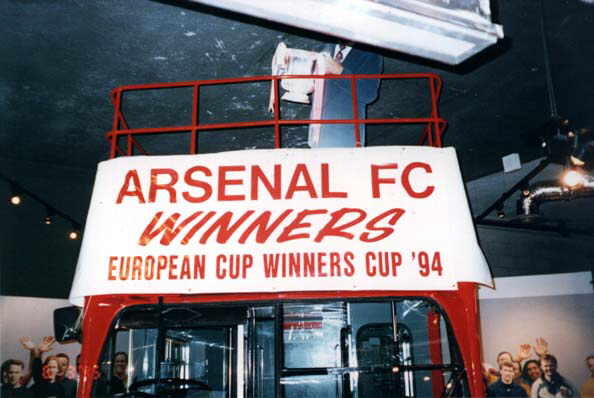 There are quizzes, pictures, a historical movie, a representation of the famous "Victory Bus", sections dealing with the Wonderful 30's, the Double winning 1970-71 season, the George Graham Reign, and Highbury Stadium through the years. There are shirts, balls, ribbons, banners and all number of other things that will keep any Arsenal supporter enthralled. If you have the opportunity to visit The Arsenal Museum, I thoroughly recommend it.